What do President’s Club and short track speed skating have in common? Nothing. From the moment a short track speed skating race starts the competitors are focused and intense, leveraging strength, speed and a great deal of strategy to win. From the moment President’s Club is announced the competitors…look forward to perhaps earning a spot on that list? Where’s the MOTIVATION? “Well yeah, we have end-of-quarter bonus awards for the rep that sold…. These contests/programs are important, as they tend to become part of the company culture, and the recognition is appreciated, worn as a badge of honor and even included in resumes. However, of all the best practices we have learned over the course of time, one of the most important is: Shorter contests motivate more. These traditional contests like President’s Club and other long-term competitions certainly have their value, but they aren’t very good at creating a swell of energy and motivating key behaviors that drive revenue. 1. The shorter the contest, the flatter the hockey stick. Long-term competitions (> 30 days) provide a sense of comfort in time and therefore, do not create a sense of urgency (a.k.a. motivation) until very late in the game. Getting a flurry of the desired behavior at the end of a competition doesn’t help create habit, nor will it create the results you were looking for. Keeping competitions short creates urgency and intensity from day one. 2. Short contests give everyone a chance to perform. In most cases, those at or near the bottom of a long-term competition tend to become complacent, if not discouraged, by half time. Perhaps the competition didn’t target their strengths, or they work differently than others, or maybe they truly need some coaching. Regardless, once this separation happens, a large percentage of competitors tune out entirely and fall back to their normal operating procedure. Let those that struggle learn quickly and then hit the reset button. 3. Short contests keep things fresh; change it up. Getting the attention of a sales person is difficult, especially if that focus doesn’t blatantly affect their compensation plan. If you can only garner their attention on one competition at a time, it needs be exciting and new (Love Boat, anyone?). So, another quarter-long competition measuring who closes the most or who makes the most calls? Been there, done that. By only running the same President’s Club type of competitions, you are missing the opportunity to impact key areas of the sales process, different groups or different skills sets within the team. Naturally, some competitions will have greater results than others. If they are shorter, you can try and try again, eventually honing in on what works for your sales team. Don’t hesitate to get started on running new, fresh contests. Even in environments with long sales cycles there are key behaviors that can make an impact in revenue from a 5-day contest. 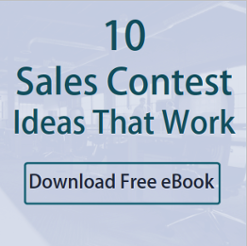 Examples include competitions around advancing sales stages, connecting with new influential contacts or sending valuable industry content between meetings. There are also always these contest ideas. Don't count on a President's Club-type competition to be the ultimate sales motivator.